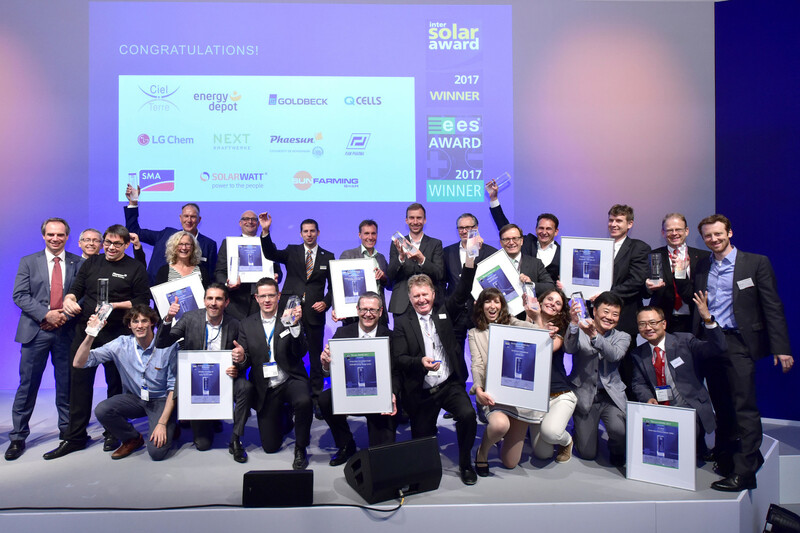 In 2017, ees Europe, Europe's largest exhibition for batteries and energy storage systems, takes place in parallel to Intersolar Europe for the fourth time. Find here more information on the winners of the ees AWARD. Hanwha Q CELLS, South Korea/Germany, is presenting an innovation worthy of an award: the Q.PEAK RSF L-G4.2 360-375 module. On top of its high efficiency level, this product is sustainable and easy to integrate. Rather than aluminum, the frame is made of folded steel, which improves the module’s CO2 footprint by around 15 %. Furthermore, a newly developed mounting concept not only speeds up installation and keeps labor costs to a minimum, it also saves up to 80 % in material costs. The panel praised the combination of innovative design and product sustainability. With the SMA Sunny Tripower CORE1, German solar energy equipment supplier SMA Solar Technology developed a free-standing string inverter adapted for use on commercial rooftops and on the ground. The optimized installation and easy configuration allow this inverter to be quickly connected to the grid. The new, active cooling system is the basis for a unique design with easy access to all components and connections for direct and alternating current. Integration into the power system is easy thanks to effective control functions. The certified SMA Sunny Tripower CORE1 can help save 20 % of costs compared to other SMA products in the market. The panel was impressed with the efficiency of the technical design and the product’s improved handling. The joint project between the University of Hohenheim and Phaesun as technology partner was initiated by the Deutsche Gesellschaft für Internationale Zusammenarbeit (German Society for International Cooperation (GIZ). Phaesun specializes in the sale, installation and operation of offgrid photovoltaics and wind energy systems. The award-winning system uses solar energy for cooling milk in Kenya and Tunisia. The concept maintains the cold chain for storage and transport of milk, which is particularly critical in off-grid regions. The system is based on conventional direct current refrigerators equipped with a smart component: The cooling power demand is adapted to the solar energy generated each hour and batteries are replaced by thermal energy storage in the form of ice. The project’s potential positive effects on society and the economy, as well as the favorable business case won over the panel of judges. Next Kraftwerke from Germany operates one of Europe’s largest virtual power plants, which encompasses 4,200 medium and small units. The total output of the Next Pool virtual power plant is almost 3,000 MW. Next Pool uses digital networking to close the gaps resulting from fluctuating infeed of energy. Real-time data show the output and status of each component at any given time. Even more detailed forecasts are possible thanks to real-time information and data provided via interfaces with over 15 inverter manufacturers. The panel feels that the business model is important for the development of regulatory framework conditions. The judges also praised the contribution made to the future development of global power supply.